Our 1×18 Finger-Jointed Clear White Pine (aka Radiata Pine) lumber is sold by the linear foot. 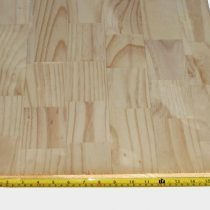 Boards are finger joined and glue-laminated together to provide a wider durable board. Board is S4S where both sides and edges are planed smooth. Actual board dimension is 3/4″ thick by 17-1/4″ wide.